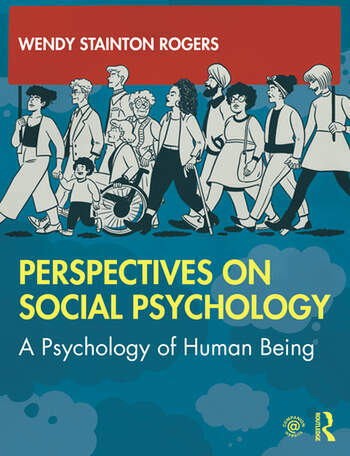 This ground-breaking new textbook takes a different perspective on social psychology, focused on the social and cultural worlds we inhabit, encompassing a wide range of core social psychology topics – from the self to relationships; gender to health; racism to mental distress. Taking a critical approach, the book explores how qualitative methods and interpretational analyses can be used to examine human behaviour and what it is like living in today’s media-led world. It explicitly challenges all forms of Othering, taking a fresh look at human values, embodiment, agency, communication, thinking and feeling. It goes beyond the individualising scientific approach taken by traditional psychology, instead concentrating on the psychology of what makes us human – qualities like empathy and compassion, courage and dignity, kindness and sympathy – and how we can nurture them. Offering a fascinating alternative to existing resources and enhanced by carefully chosen full-colour illustrations, the book and associated companion website include original pedagogical features such as reflective exercises, further resources, and a glossary, offering opportunities for readers to customise their learning experience. Featuring a course mapping section that sets out how the text can be used in relation to psychology curriculum requirements and common course structures, this interdisciplinary resource provides accessible and engaging reading for students studying psychology and other disciplines including sociology, cultural studies, politics, and media studies, as well as applied areas such as nursing, policing, and management. It is also for anyone who is interested in what psychology can tell us about our lives and place in the world. Wendy Stainton Rogers is Professor Emerita at the Open University, UK. In retirement she continues to contribute to the development of critical psychology and qualitative research in psychology. Her most recent publication was co-editing (with Carla Willig) The SAGE Handbook of Qualitative Research in Psychology, 2017.